The "Baby Boom" reached his highest point, the Soviets launch Sputnik 1, and the "Little Rock Nine" fought against segregation. By the time 1957 dawned, the Second World War had been decided for more than a decade, but the world was still being shaped by the results of the conflict. The post-War increase in birthrate, the "Baby Boom", reached its highest point in 1957 with a birth rate of 25.3 births per 1,000 population. An era ends when the final issue of Collier's Weekly hits the stands on January 4, 1957, but one only had to look around while standing in front of the newsstand to realize that a new era was dawning. 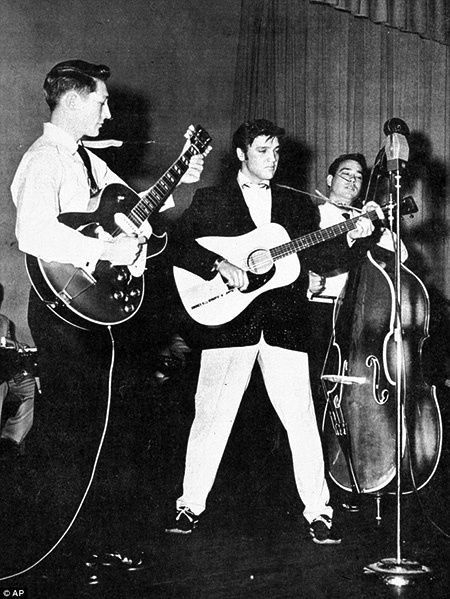 On January 6, Elvis appears on The Ed Sullivan Show for the third and final time, to avoid controversy he is only shown from the waist up, even while singing the gospel classic "Peace in the Valley". Nonetheless, Sullivan enthuses about what a "decent young man" the singer is and predicts greatness in his continuing career. Just 22 years old, Elvis buys the Graceland estate in Memphis, Tennessee, on March 26. His second film and first starring role, Loving You, opens July 9. The dance scene to the title song of Elvis's third film, Jailhouse Rock, released on November 8, is still considered the King's greatest moment on screen. 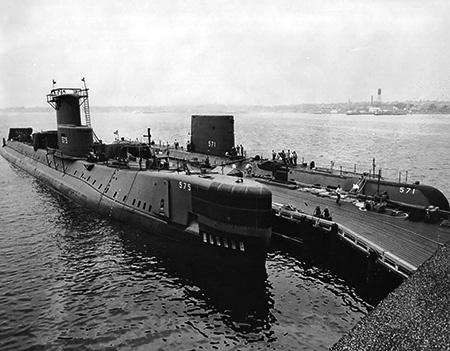 President Eisenhower is sworn in for his second term, and the USS Nautilus, the world's first nuclear-powered submarine, logs its 60,000th undersea mile on February 4, matching the record of its fictional namesake from Jules Verne's' Twenty Thousand Leagues Under the Sea. Construction is completed on The Dalles Dam between Oregon and Washington and the floodgates are closed on March 10, hundreds of onlookers watch as the floodwaters cover Native American salmon fishing platforms and drown an ancient and respected way of life. North of the Arctic Circle, construction is completed on the radar stations of the Distant Early Warning (DEW) Line and contractors turn the project over to the American and Canadian Armed Services on April 15. The International Geophysical Year kicks off in July. The hope was that the IGY would represent a thawing in the chilly Cold War relations between the scientific communities of the East and West with ongoing international experiments and demonstrations in Earth Sciences with data shared openly. The IGY was timed to coincide with a cycle of solar flares and a highlight was to be the launch of an artificial satellite to orbit the Earth. Three US programs of the pre-NASA era competed for approval to be the first to send a craft into orbit, but these efforts were delayed for technical and political reasons. 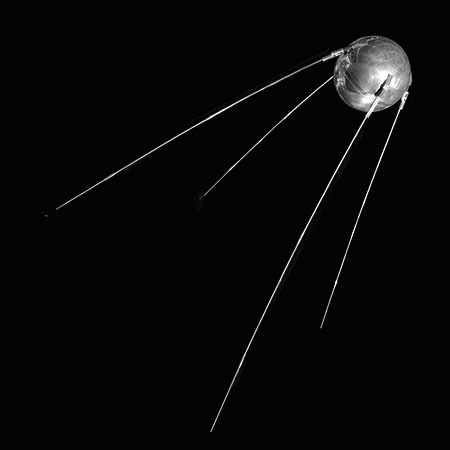 On October 4, the Soviets surprised the world by launching Sputnik 1. Although the tiny spaceship was little more than a stainless-steel sphere with a beeping radio transmitter that amateur radio operators could hear as it passed overhead, the achievement of getting the thing up there was a major blow to the morale of the American science and aviation communities. Special Forces Captain Hank Cramer becomes America's first combat death in Vietnam on October 21, but a more notable and public use of American troops will occur domestically. In response to the 1954 Supreme Court Brown vs the Board of Education decision, the NAACP began encouraging African-American students to register for classes in all-white schools. A plan was developed for the gradual integration of Little Rock, Arkansas, schools, to begin with, nine black students entering Little Rock Central High School in the fall of 1957. The plan seemed to satisfy almost everyone, except for a vocal group of local segregationists who planned to physically block the "Little Rock Nine" from entering the school building. Governor Orval Faubus deployed elements of the Arkansas National Guard to support the segregationists. President Eisenhower warned the Governor not to defy the Supreme Court, and when Little Rock Mayor Woodrow Wilson Mann requested federal protection for the Nine, Eisenhower sent the 101st Airborne Division (without its black troops at first) into the city and federalized the National Guard, taking those troops out of the Governor's control. The Ghanaian Finance Minister, Komla Agbeli Gbedemah, traveling in the US as a diplomat, stopped at a Howard Johnson's restaurant in Dover, Delaware, on October 10, and the staff refused to serve him because of the color of his skin. In apology, President Eisenhower invited the minister to breakfast at the White House. 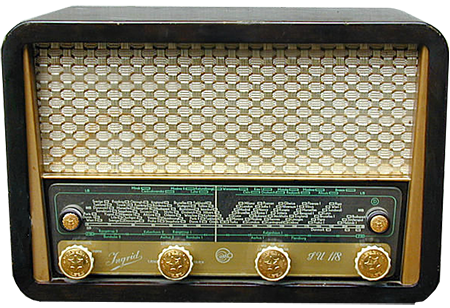 In radio, stations KBCS in Dallas and KBZY in Salem, Oregon, adopt a "Top Forty" format. CBS Radio Workshop goes off the air. The "Baby Boomer" birthrate peaks in 1957. The Brooklyn Dodgers play their last game at Ebbets Field before team owner Walter O'Malley moves the club to Los Angeles. In Brooklyn, they say: "If you asked a Brooklyn Dodger fan, if you had a gun with only two bullets in it and were in a room with Hitler, Stalin and O'Malley, who would you shoot? The answer: O'Malley, twice!" 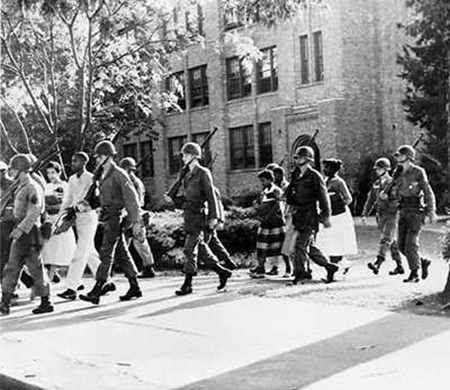 Troops from the 101st Airborne Division are deployed to ensure that "the Little Rock Nine" are allowed to attend classes at the previously segregated Little Rock Central High School. American Bandstand premiers on ABC Television. The International Geophysical Year begins in July, marking a thawing of Cold War restrictions on scinetific collaboration between East and West. The Soviet Union launches the first artificial satellite, Sputnik 1 in October. A month later, Laika becomes the first animal in orbit. WHAM-O Mfg. Co. introduces the Frisbee. The full-sized Pontiac Bonneville is introduced for the 1957 model year, and will be one of the largest cars produced by Pontiac. The Rambler Rebel becomes the first mid-sized high-performance cars, launching the "muscle car" segment. In Milwaukie, Harley Davidson introduces the iconic Sportster line with a 45 cubic inch (750 cc) displacement engine. The Crown and the Land Cruiser are the first Toyotas imported to the US. Have Gun, Will Travel premieres on CBS TV, and will come to CBS Radio the next year. KNOC Dallas becomes the first station in the nation to adopt a full-time Rhythm and Blues format while KBCS Dallas and KOCO Salem, Oregon, come on the air with a Top 40 format. The last episode of CBS Radio Workshop broadcasts in September. Be the first to comment on "1957"